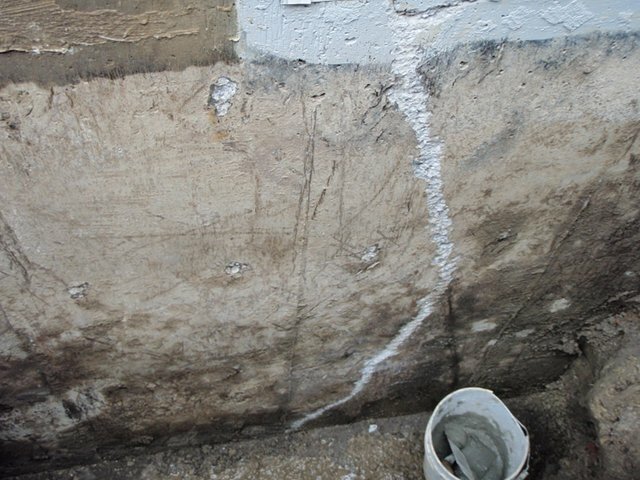 Wet basement repair is the logical final step of basement waterproofing. Don’t even think of wet basement repair until you have first solved the problems which make it wet. Once the source of leakage has been identified and resolved, you can deal with the damage which it caused. Your wet basement repair is not finished until you have renovated all damage. The first stage of wet basement repair is stopping the leaks. When you are certain that the leakage has been resolved, it is time to repair the area. Begin by thoroughly scrubbing the walls, the floor, the ceiling, and any exposed frame members or plumbing. Be very careful to remove any fungus, and any chalky mineral deposits. Ventilate the area until walls, floor, and ceiling are completely dry. Now you are ready to begin the actual wet basement repair. The next step of wet basement repair is to seal any cracks. Don’t just try to hide them with a coat of paint – painted cracks are guaranteed to show! Open any existing cracks by chipping or grinding. Be sure to provide enough depth and width to support a robust, structurally sound repair. Use a good grade of patching material which is appropriate to what the wall / floor is made of. Be sure that there is no dust or other loose material which might prevent bonding of the patch. Carefully apply the patch, avoiding any build-up beyond the surface of the surrounding material. This step is crucial to wet basement repair.